Join the fight to stop fracked gas infrastructure in New York. For years New York Governor Andrew Cuomo couldn’t go anywhere without the anti-fracking movement being there. He couldn’t even have a birthday party without folks outside calling on him to ban fracking. And on December 17, 2014 Governor Cuomo listened to the people of New York and the overwhelming science that said there is no safe way to frack, and banned fracking in New York State. It was an incredible grassroots victory and one of the largest to date for the climate movement. And it’s a laurel that Governor Cuomo and his administration often site to prove he is a climate leader. In a recent opinion piece, Cuomo’s energy czar Richard Kauffman cited the fracking ban as the number one bullet point to prove Governor Cuomo is a national leader on climate and is spearheading the transition to a clean energy future for New York. But there’s a big piece of New York’s energy trajectory that Kauffman left out, our state’s massive build out of fracked gas infrastructure. In fact, a recent report issued by Little Sis proves that New York’s agency NYSERDA, which Kauffman directs, is funneling millions of dollars intended for renewable energy development into fracked gas development. And so far in 2018, an election year for the governor, Cuomo has remained silent on fracked gas infrastructure while continuing to tout banning fracking as one of his “progressive accomplishments”. A Cuomo pollster said Zephyr Teachout was able to do so well against Cuomo in the 2014 Democratic Primary because she was “running with the wind of a strong issue in fracking” but any challenger to the Governor this year wouldn’t have that. Clearly that pollster hasn’t been to the communities where fracking infrastructure is being built. Like Orange County, where Competitive Power Ventures (CPV) is building a massive 650-megawatt fracked gas power plant in Waywayanda, New York. Residents there are already being poisoned as the plant tests on diesel and they hold Governor Cuomo responsible for every bit of pollution that is falling on their homes and families. Despite his promise to double down on dirty fossil fuels, Cuomo’s administration approved multiple permits for the CPV fracked gas power plant, all while Cuomo’s former top aide, Joseph Percoco, was receiving hundreds of thousands of dollars in bribes from CPV. The Orange County residents who have been picketing outside the CPV construction site every Saturday for years don’t see Cuomo’s ban as a progressive victory as long as he continues to support fracked gas infrastructure. The power generated by the CPV plant is slated to go to NYC, an area that was vehemently opposed to fracking and is greatly threatened by climate change. And it’s not just NYC that will be powered by fracked gas under Cuomo’s energy plan. 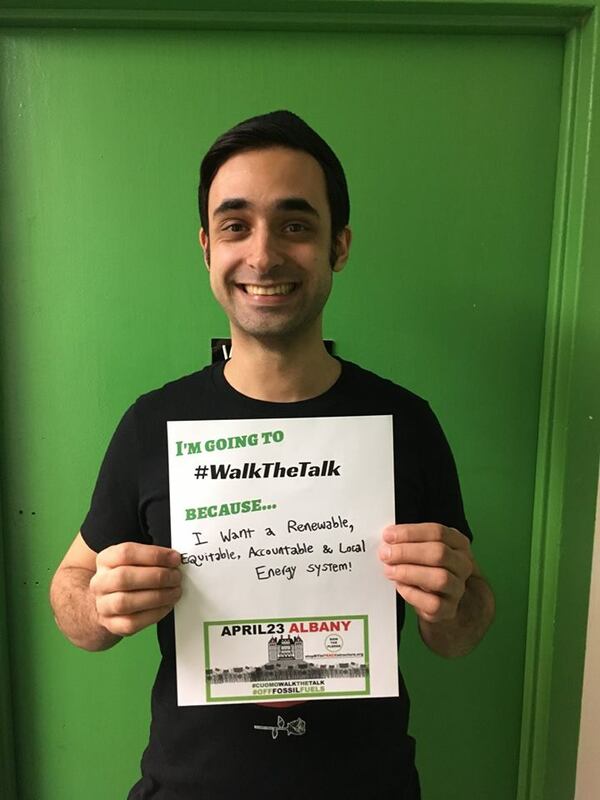 In a move of incredible hypocrisy, Governor Cuomo's NY Power Authority has proposed to power the capitol buildings in Albany with a 7.9-megawatt fracked gas power plant located in the environmental justice community of Sheridan Hollow. · Halt all fracked gas infrastructure. · Move to 100% renewable energy. · Make corporate polluters pay. The message that united New Yorkers from across the state in the fight to ban fracking was “not one well”, that every single New Yorker deserved to be protected, that there would be no sacrifice zones. But right now communities all over the state are being sacrificed to fracked gas infrastructure. Mothers have to worry about highly pressurized fracked gas pipelines near their children’s schools and compressor stations near their homes that expose their families to all the same pollutants that fracking does. As long as a single community is being harmed by fracked gas infrastructure, the fracking fight in New York isn’t over. 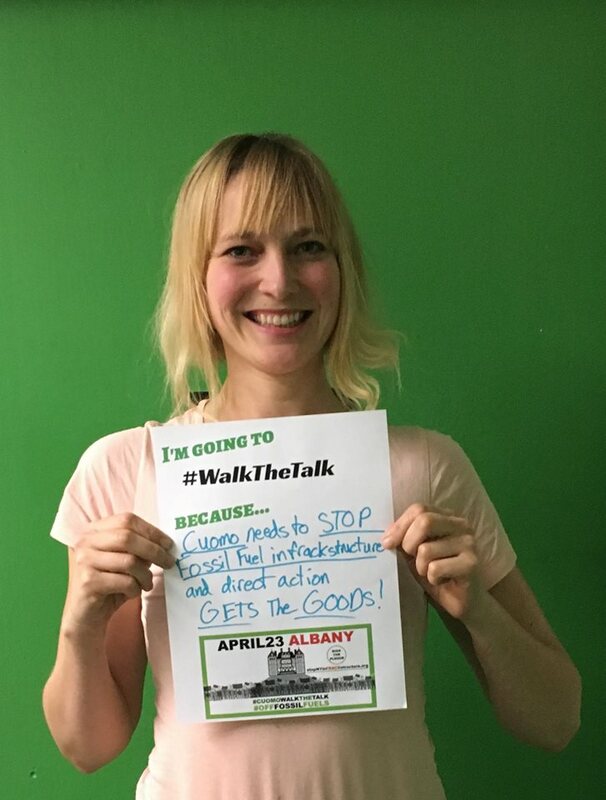 Join us in Albany on April 23rd and call on Governor Cuomo to Walk the Talk.